All selected Freshman Terry Scholars will live together as part of the Terry Living Learning Community and be in the success program called ASPIRE (Aggie Scholars Promoting Incentive, Resources, and Encouragement). 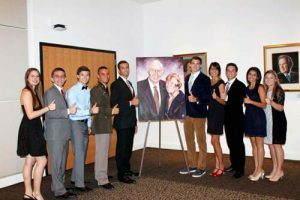 The success program operates on a mentor platform consisting of a group of upper-class scholarship recipients who volunteer time to assist scholarship freshmen “learn the ropes” of college life. Be selected by the Terry Foundation as a Terry Scholar. Each freshman will be assigned to an individual mentor and a small community including other freshmen and mentors. Each small community has an Exec Team member. Both mentors and the Exec Team member are there to help the Terry Scholar freshmen to adjust to college. In addition to the UGST class, there will be social events, intramural sports, community service, and networking with Aggies in the B/CS community.